Do you dread winter and wish you could hibernate like the bears? Are you counting down the days until Spring? Are your moods low, do you eat more and do you wish you could sleep all the time? If so, you could be suffering from Seasonal Affective Disorder (SAD). SAD is a mood disorder in which people who have normal mental health throughout most of the year experience depressive symptoms in the winter or, less frequently, in the summer, spring or autumn, repeatedly, year after year. Studies done in Ontario indicate that 1–3 per cent of the general population has SAD. Another 15 per cent of people have the “winter blues”, symptoms similar to SAD, but not to the point of having a clinical depression. Recent studies estimate that SAD is more common in northern countries because the winter day gets shorter as you go farther north. There are a few different theories as to what causes SAD. A lack of serotonin (which has various functions, including the regulation of mood, appetite, sleep, muscle contraction, and some cognitive functions including memory and learning) is one suggested cause. Or itt could be the production of melatonin, which tells our body that it’s nighttime. Usually, bright light at daybreak is the signal for the body to stop producing this melatonin; but on dull winter days, especially indoors, not enough light is received to trigger this waking up process. Another explanation is that vitamin D levels are too low when people do not get enough Ultraviolet-B on their skin. Symptoms of SAD tend to start around September and last until April, but are at their worst in the darkest months. They include changes in mood such as irritability, depression, despair, misery, guilt, anxiety, and difficulty performing normal tasks. Sleep is also affected – you may have difficulty waking up in the morning, you may tend to oversleep and need naps throughout the day. Some people crave carbohydrates and chocolate, which leads to weight gain. You might experience joint pain or stomach problems, have a lowered resistance to infection, experience sweating, cramps or frequent urination. Other symptoms include difficulty concentrating on completing tasks, withdrawal from friends, family, and social activities and the potential risk of suicide in some people experiencing SAD. Women are two to three times more likely to suffer from the winter blues than men. Though symptoms can be severe, they usually clear up. Fortunately, SAD can be effectively treated. One of the most effective treatments is light therapy using a light. Light boxes work by reducing the release of melatonin in the brain. For best results, use a light box daily, in the early morning, and for around 30 minutes a day. You don’t have to stare at the light, so you can do other tasks such as read or watch TV – just make sure that light reaches your eyes. Light boxes are available through your pharmacist. 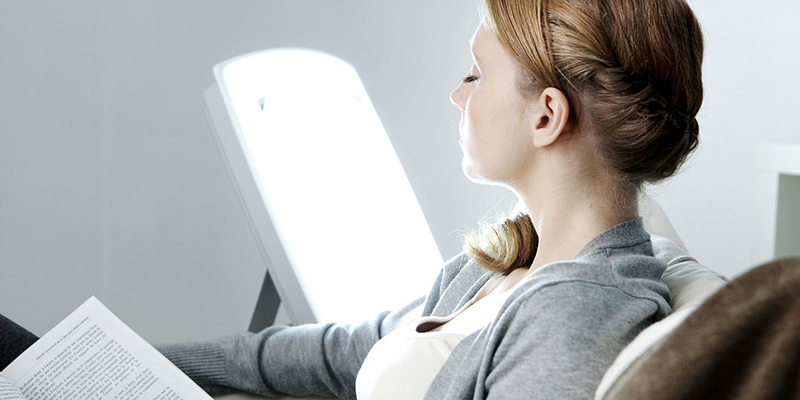 People using light therapy can experience improvement during the first week, but increased results are evident when continued for several weeks. Other tricks include exposing yourself to sunlight as early in the morning as you can, exercising, going on a trip to a sunny destination, eating a balanced diet, maintaining your schedule and routine, seeking out family and friends for support, taking anti-depressants and vitamins, and counselling. If you believe you are experiencing symptoms of SAD, please consult with your doctor to confirm this. It is also important to consult with a pharmacist before trying over-the-counter and prescriptions intervention.